Patients with misaligned teeth no longer have to rely on immature-looking metal braces for more attractive smiles. A revolutionary system, Smart Moves®, straightens teeth discreetly, comfortably, and affordably. If you have mild to moderate misalignments, Dr. Danner may recommend Smart Moves® invisible braces. 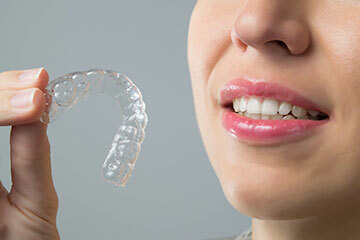 Smart Moves® involves custom aligners made from impressions taken of your teeth. Unlike other aligner systems, Smart Moves® aligners are made as needed, so you won’t have to pay for aligners you may never use. Simply visit our office periodically for new impressions and new aligners made with patented Hard/Soft technology for optimal comfort. With Smart Moves® invisible braces, you wear a softer aligner first, while your teeth adjust to their new position. After the first week, you wear a harder aligner that helps hold your teeth in their new position. With Smart Moves®, you can remove the aligners before you eat and drink, and the aligners are clear, so no one will know you’re wearing braces.